Warm days in spring season gives out a signal that summer days are nearby. 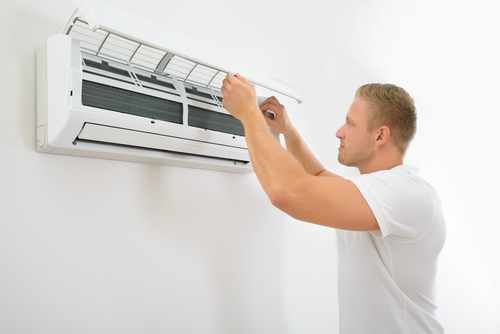 People start using their AC systems to cool down the rising temperature and get comfortable inside the house. It is important to become and stay comfortably inside the house, but it is also important to care about home efficiency and thing about saving utility bills. There is a solution to this problem. By installing ductless mini split systems you can be comfortable inside your house and also cut down in your electricity bills at the same time. This unique heating and cooling system is the best solution for homeowners who worry about their utility bills and also require a comfortable temperature inside their house. If you are building a new house or just replacing your old AC, you should know about your energy efficient and new options available in the market today. Earlier homeowners used central air systems which delivered treated air inside the house through ducts. Even though people still use central air systems, ductless mini systems are also getting popular these days. Ductless spilt models are compact, easy to install and energy efficient. The ductless mini split HVAC systems have only two components – the exterior unit (condenser) and the interior unit. These two components are connected with a conduit and no ducts are used. One of the best things about ductless split systems is that an exterior unit can support up to 8 interior units. Each interior unit can have its separate temperature settings and operate individually. During summer and winter season people require cooling and heating for almost 24 hours a day. Any homeowner would worry about his electricity bill while using the air conditioning system all day. Ductless mini split system is the best solution to save money on utility bills. The above mentioned are ductless mini split systems. The initial cost of investment for any ductless mini split unit is expensive but it is considered as an initial investment for the profits in future. As there are no ducts involved in the ductless mini split systems, the unit requires less energy to operate. The ductless system basically transfers the heat from the outside environment to the insider. No actual heat is produced in the system. The heat or temperature of the outdoor is condensed in the condenser and is delivered indoors, according to the user’s specific temperature setting. The Carini air produced by the ductless mini split system is safe and is produced naturally. You should consider investing in a ductless min split system for your house. It will not only help you to save money but will also provide you with excellent service of cooling and heating.